Contrary to the common belief that youngsters watch more television on weekends, a study by BARC India suggests that viewership of youth (15-30 years) follows a consistent trend across weekend and weekdays. The viewership is the highest during prime time. It starts from 6 am, rises gradually through the day and peaks between 8.30pm and 9.00 pm. The gap between reach and impressions is marginally higher on weekends, indicating there are not enough conversions when compared to the weekdays. This may likely be due to other activities competing for the attention of the youth, and hence showing scope to create compelling content to attract the youth. The study titled ‘What Young India Watches’ was released under the ThiNK Newsletter of BARC India. It stated that the youth as a television audience contributes 33% share of eyeballs to the total TV viewership, across ages. The youth population composition is relatively skewed towards males, but when we look at the viewership share we see that the female viewership is comparable to that of males. Both contribute an equal share of eyeballs in TV viewership, 50% each. A typical Indian youth likes to start his day with film-based programmes as the preferred choice. This is followed by some programmes classified as miscellaneous and news/ business. The choice of film-based programmes dominates non-prime time from 6am to 6pm. As the day progresses towards prime time, the viewership share of serial-based programmes goes up, and that of film-based ones starts declining. This viewership of miscellaneous programmes after 6pm is being driven by reality shows and talent search programmes, which are usually aired on weekends, thus contributing to the high viewership. The viewership of miscellaneous programmes in the morning is primarily being driven by religious/astrology shows. This viewership of kids’ cartoon shows could mean that some teens in the audience segment are primary viewers. Additionally, it could also be indicative of co-viewership of young parents along with their children. The higher share of viewership for films could most likely be attributed to special programming such as world TV premieres or airing of popular movies, which usually occurs on weekends. As television prime time begins on a typical weekday, we see the viewership share for serial-based programmes almost double as compared to the previous time band. This seems to be consistent with the strategy of key shows and serials being aired during prime time. Sports programming enjoys a relatively better share on weekends among the youth. In sports, viewership depends on when an event is being aired. The youth in rural India prefer to start their day relatively early as compared to urban areas and the metro cities. A similar pattern is seen during closing the day. Youth in rural areas start their day at 5.30am, those in urban at 6.30am and in megacities at 7.30am. Viewership share for serial-based programmes rises substantially after 6pm, and the share of film-based programmes decreases. The growth in viewership of serials in prime time is primarily driven by the youth in rural regions. We had earlier observed that news/ business programmes are preferred in the early morning time bands on both weekday and weekends. Interestingly, this observation holds true across urban, rural and even megacities. This could be arising from the general habit among Indians to read the newspaper first thing in the morning, and probably follow it up with updates on news channels. Contrary to popular belief, niche programmes such as lifestyle, nature and tourism, or music do not witness significantly higher viewership in megacities or urban audiences, compared to rural areas. This could mean that the youth are unified in their viewership for such programmes. Hence, while there may be some similarities in the general viewership patterns of the youth, there are clear differences in terms of content preferences, especially in megacities and rural areas – the two extremes of the pop strata scale. The youth genre gets merely 1% of youth viewership. The genre is small with just four channels but some of the other genres that are ahead in terms of attracting youth viewership are sports (3%), kids (4%), music (7%), news (7%), movies (25%) and GECs, which lead with 51%, as per the 2017 data. Since it is a smaller genre, there may be some potential to expand the youth genre like new channels catering to the youth. The reach and stickiness of various channel genres vary for rural youth audience versus the youth in megacities. In megacities, youth channels have the maximum reach among genres. 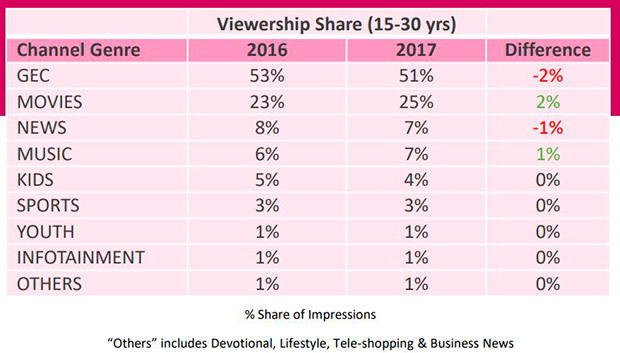 This means that the youth in the big metro cities are increasingly sampling these channels, and there may be an opportunity to hook and engage these viewers with new channels in the genre with fresh positioning and content. Being a property-driven genre, the reach of the sports genre is relatively less when averaged across weeks. However, during big-ticket events, the reach of this genre tends to increase. The aspiring Indian youth has increasingly more dispensable income and open minds. They are willing to try and buy new products, which makes them an important consumer segment for all marketers and advertiser. However, the rural youth and youth in megacities may differ in their preference and capacity of purchase, due to socio-economic differences. 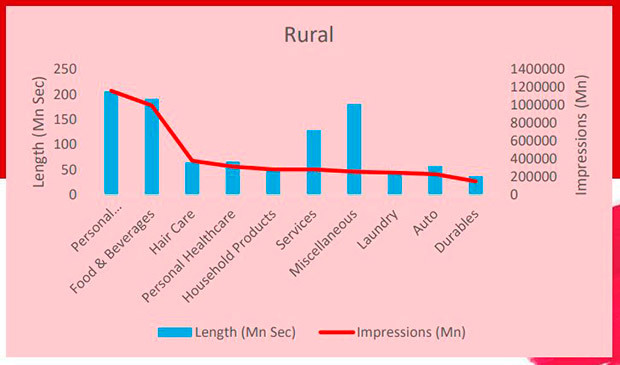 Personal care/personal hygiene and F&B sector together account for 50% of the advertising impressions from youth in both rural India and megacities. 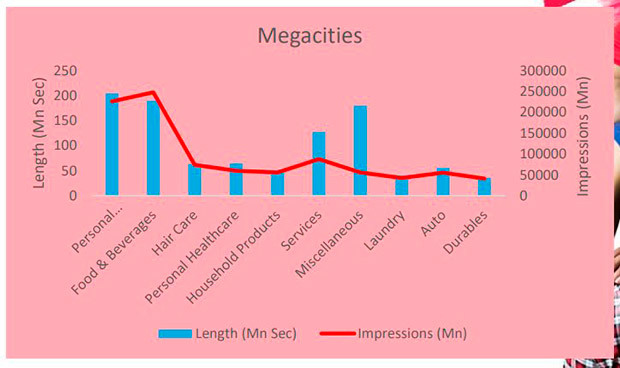 These are also the most advertised sectors, and hence volume may be leading to viewership. While the top contributing categories in the personal care and hygiene sector includes soaps, perfumes/ deodorants, face washes and fairness creams, which are high on self-involvement, F&B categories such as chocolates, milk beverages and biscuits are high impulse purchase products. Many brands operating in these categories are mass advertisers and their communication is directly targeted at the youth. When we look at the auto and durables sector, we find that these sectors are relatively more effective in megacities than the rural audience. This could mean that the youth in mega cities is well-to-do economically, and may seek information through TV ads for purchase consideration. The youth in rural towns may not be very receptive towards advertisement for high involvement products. The most effective sectors among the rural youth are laundry and hair care. This is interesting, as many players in this sector have come up with smaller packaging units at lower price points to appeal to this segment. The services sector is being driven by internet services and ecommerce categories in both rural and megacities. However, it is not as effective in rural towns, while in megacities it ranks as the third most effective category. This could likely be due to the digital divide between youth in rural areas versus youth living in the metro cities, resulting from factors such as internet penetration, data availability and connectivity.